Roasted Asparagus is a simple side dish that will be ready in less than 20 minutes. 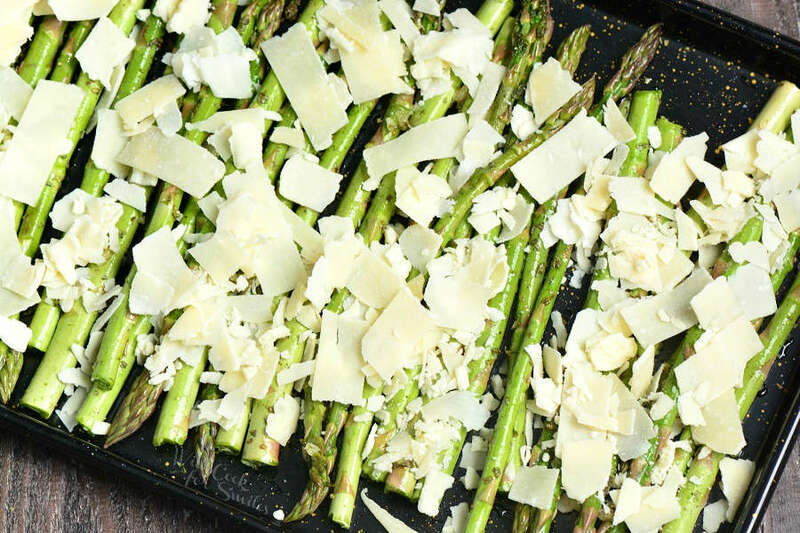 This asparagus is evenly coated with olive oil, garlic, salt, pepper, and herbs and then, covered with shaved Parmesan cheese and roasted in the oven. Asparagus compliments many main dishes and will go great with chicken, beef, pork and seafood. Roasting vegetables is the simplest and tastiest way to make a fast vegetable side dish. 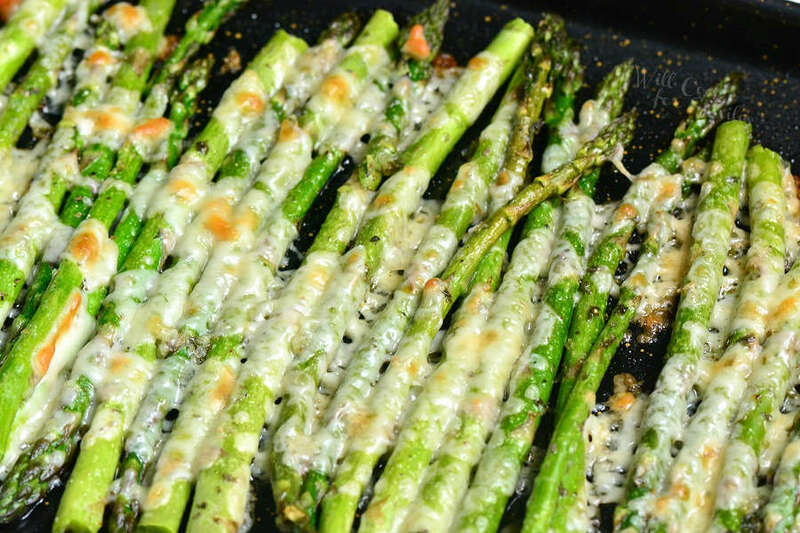 Besides cauliflower, asparagus is my favorite vegetable to simply roast in the oven. Even simply seasoned with salt, pepper, and some garlic powder, veggies taste amazing roasted. High heat bring out a the natural flavors of vegetables and gives it a nice caramelization on the bottom. Thin, small ends and pieces get nice and crispy too. Crispy ends is my absolute favorite part. Even though simple salt, pepper, and garlic powder is a good seasoning, I love to throw in some classic Italian flavors. I use fresh garlic instead of garlic powder and rub it onto the asparagus with some olive oil, salt, and pepper. Then sprinkle oregano and parsley over seasoned asparagus. 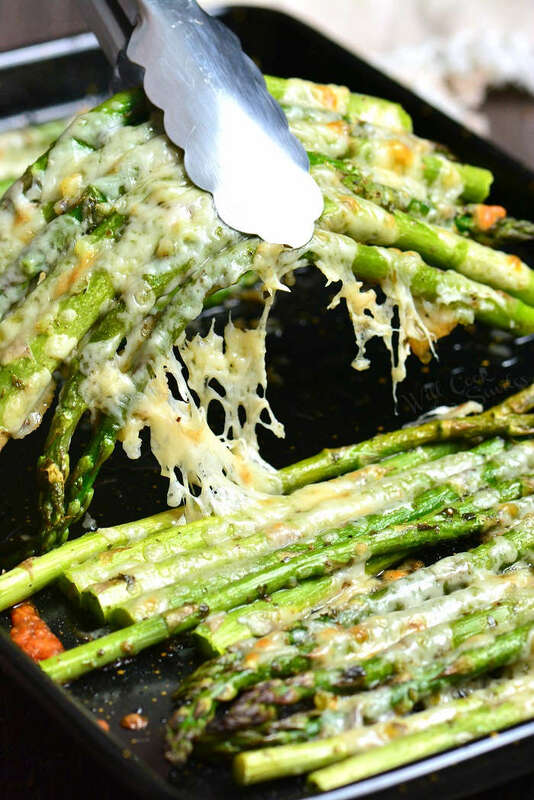 Shaved Parmesan cheese on top is the perfect finish for this Italian Roasted Asparagus, especially when the cheese melts onto the asparagus. When choosing asparagus, try to pick out a bunch where most of the stalks are uniform in size. Get asparagus that is not too thick and not too thin. Really thick stalks will take a much longer time to roast and cheese will start burning. Very thin stalk of asparagus might be too soft by the time cheese gets golden. Try to get thicker shaved Parmesan cheese. If it’s shaved too thin, it will cook too fast. 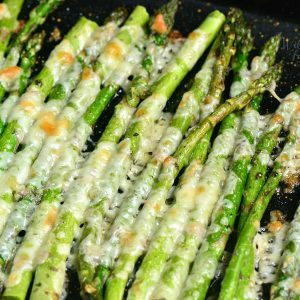 If the only available shaved Parmesan cheese is very thin, you can always spread it onto the asparagus half way through the baking time. Size of asparagus and thickness of cheese will affect bake time by a couple of minutes. Make sure to check on the asparagus every couple of minutes after it’s been in the oven for 10 minutes. Preheat oven to 425° and lightly grease a rimmed baking sheet big enough to fit asparagus in one even layer. Take the rubber band off the asparagus, rinse it in cold water and pat dry. You will want to chop off the thick, coarse ends that are light in color. Spread asparagus in the baking sheet, drizzle it with olive oil and season with salt and pepper. Peel and press garlic cloves and then rub asparagus with pressed garlic, spreading olive oil and seasoning at the same time. Lay out coated asparagus in one even layer but close enough together so the cheese can be spread on top evenly. 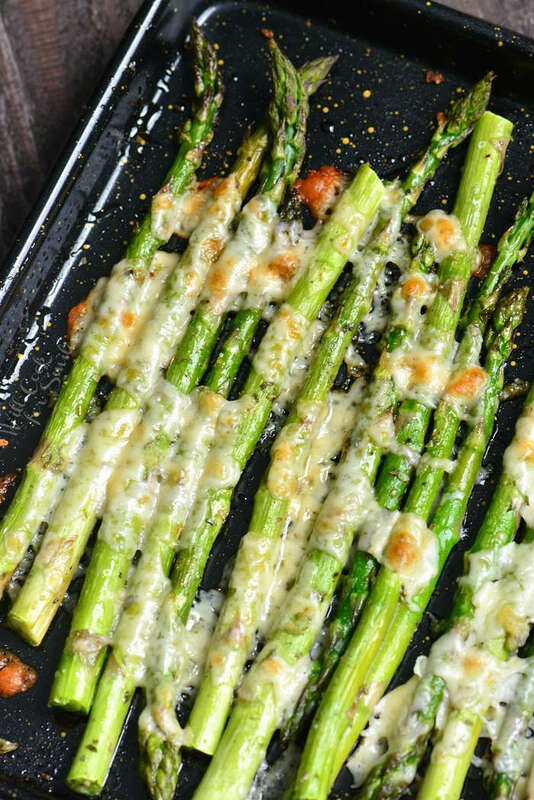 Spread shaved Parmesan cheese over asparagus and bake for 10-12 minutes. Average bunch of asparagus is about 3/4 to 1 lb and will serve 2-4 people. Of course, deciding how much asparagus to get is highly dependent of what else you will be serving. If you’re planning on a big dinner with a main dish and several different sides, estimate a bunch of asparagus to be enough for 4 people. If you’re planning a simple dinner with a main protein and 1 or 2 sides, estimate that a bunch of asparagus will be enough for 2 people. Roasted Asparagus is a simple side dish that will be ready in less than 20 minutes. It's made with addition of Italian flavors like oregano, parsley, and Parmesan cheese. Preheat oven to 425° and lightly grease a rimmed baking sheet that's big enough to fit asparagus in one even layer. Wash, dry, and trim thick light ends off asparagus. 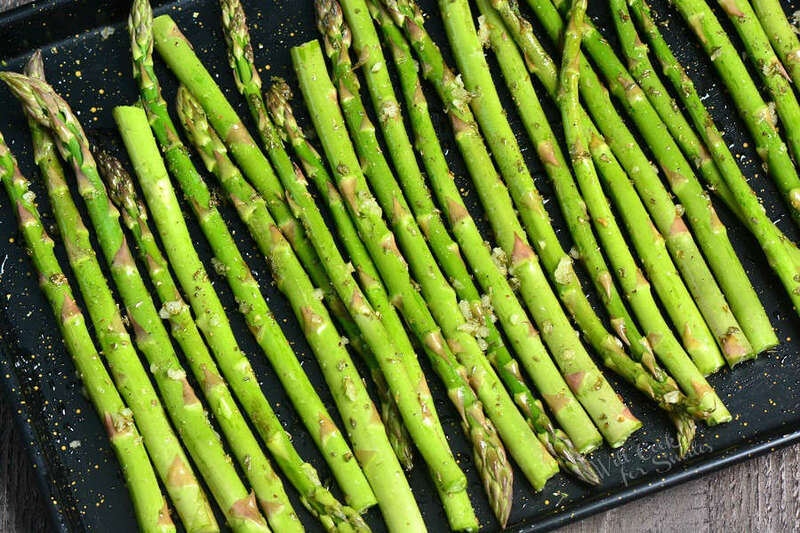 Spread asparagus in the baking sheet, drizzle it with olive oil and season with salt and pepper. Peel and press garlic cloves and then rub asparagus with pressed garlic, spreading olive oil and seasoning at the same time. 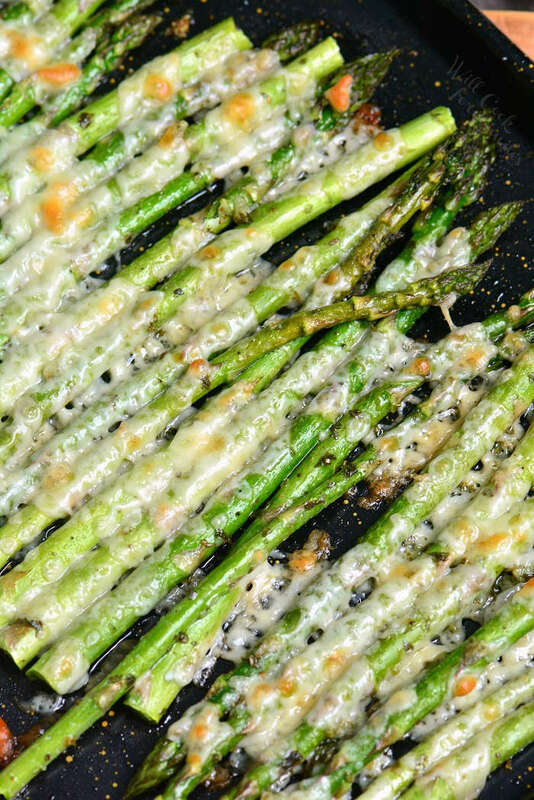 Lay out coated asparagus in one even layer but close enough together so the cheese can be spread on top evenly. 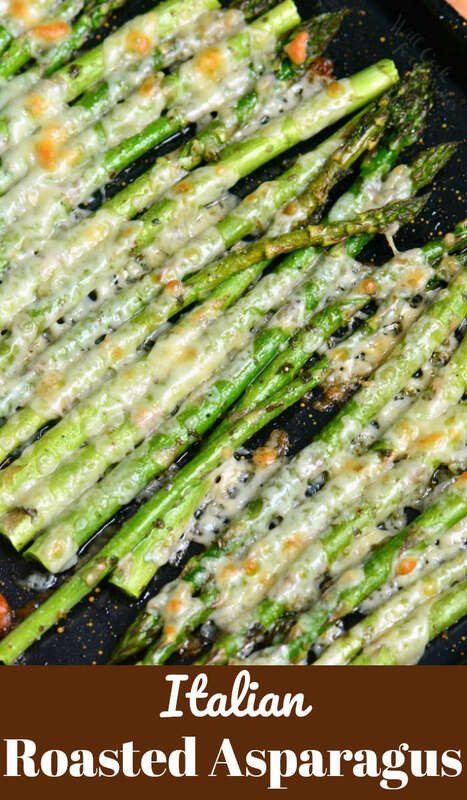 Spread shaved Parmesan cheese over asparagus and bake for 10-12 minutes.